Free Chromecast with Moto X off-contract purchase | Android Blast! 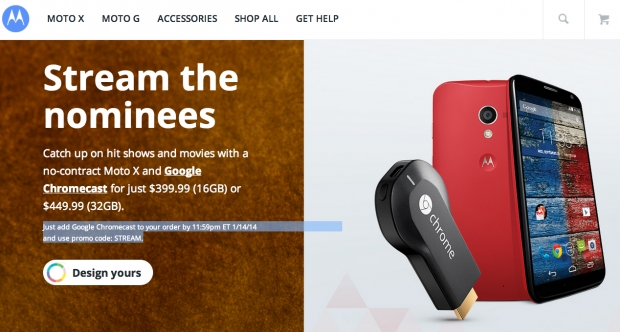 Motorola is running a special promotion that could net you a free Chromecast. Simply purchase an off-contract Moto X and they will throw in a Chromecast for free. The Chromecast retails for $35 so if you purchase the least expensive Moto X at $399.99, you're almost reaching the holiday sales price of $350. The Chromecast was a popular gadget in 2013, and it will work very well with your new Moto X. Head on over to Motorola's website to get the special offer. The promotion runs until January 14. To get the deal, just add Google Chromecast to your order by the deadline (11:59pm EST 1/14/14) and use promo code: STREAM.